Are there any beliefs you are sure are true? If not, are there any beliefs you are at least willing to explore? What are your most important doubts and unanswered questions? The Online Work Shops are an important part of the process. 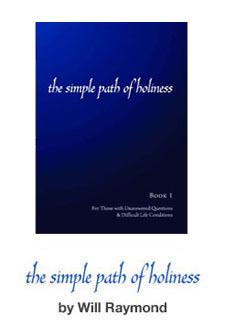 They are good supports to the commentary in the individual chapters of The Simple Path of Holiness. The following workshops are offered for free. Each consists of a series of about a dozen questions. Please feel free to complete any one or them or all three. I will be glad to provide useful suggestions about how to adapt the Simple Path to the answers you write.